Adapting its fur to its surrounding the weasel always has the latest trend. These odd looking little creatures could pass for a distant cousin to the wiener dog (Dachshund). They are North America’s smallest carnivore (meat-eater). The weasel has a distinctive look with a long body, short legs, long neck, and close cropped dense fur. For camouflage in the winter, most weasels change colour from brown, black and white, or yellow-tan to all white. The Least Weasel stands out in the Mustelid family because it is the only one without a black-tipped tail and the smallest, measuring slightly larger than a mouse. The Short Tailed weasel is roughly the size of a rat, while the Long Tailed weasel is larger like its relative the ferret. They eat a variety of small prey, but mostly mice and voles. Along the edge of bodies of water, where food is plentiful, weasels can be found hunting for prey. They often make their den in a rodent’s burrow using the fur of its prey for bedding. This solitary and opportunistic animal will make a den in any suitable crack, crevice or hole. 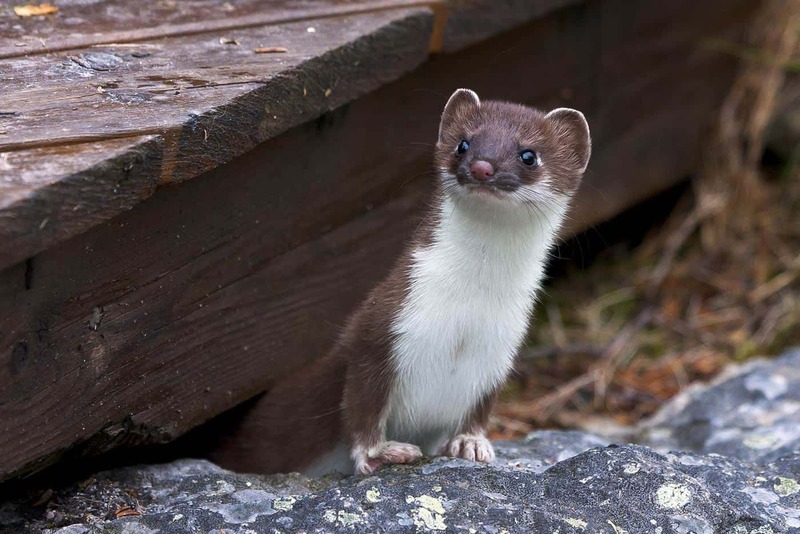 Weasels mark their territory with feces, urine and musk from their scent glands.